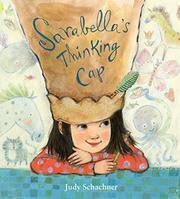 Sarabella is a quiet and contemplative young girl who doesn’t always choose to verbalize her thoughts. Within her family, Sarabella’s parents and older sister are all creatives of various stripes. (All are pale-skinned; Sarabella and her father have black hair, while her mother and sister have brown.) They love and understand Sarabella as she is. However, at school, her teacher is concerned. He feels that Sarabella should daydream less and articulate more. He assigns the class a project in which students draw their favorite thoughts. This inspires Sarabella to share her ideas in a novel way that is truly fitting for her. Visually, the book is often quite stunning, with Sarabella’s thoughts sweeping across the pages as colorful and multitextured collages of images and words. However, the story’s message that creative children may express themselves differently than others is dampened by its presentation as a problem to be solved. Sarabella sometimes needs extra time to complete her assignments, but her meandering mind doesn’t seem to be negatively affecting her learning or her ability to connect with others. This makes her teacher’s concern come across as simply a desire for conformity in the classroom. Additionally, when Sarabella stays up all night to complete her assignment, her effort reads more as a response to pressure than a truly joyful inspiration.